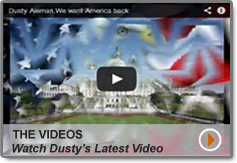 Dusty Aleman grew up in a small south central town in Texas called Smiley. He graduated from Smiley High School and later was drafted into the Army where he spent a tour in Vietnam in 1966 & 1967. Dusty started riding in rodeos when he came back from Vietnam. By the time he was 38 years old Dusty had already gone through 2 marriages and several relationships in between. During all those years Dusty had rodeoed, worked construction, and drove trucks. During the time of driving trucks, Dusty was introduced to amphetamines, marijuana, and eventually, cocaine. In July 1984, Dusty left Texas and moved to Oklahoma in the hopes of starting a new life. In September 1984, Dusty attempted to take his life twice in a week and a half by putting a gun to his head. God was able to change Dusty's mind both times. You see, God had other plans for Dusty's life. Three weeks later, in October, Dusty met his present day wife, Myrna. They were married the following year in July 1985. In August 1989, Dusty found his Lord and Savior, Jesus Christ. 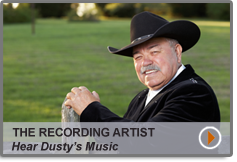 Before he met The Lord, Dusty had sang in dances, clubs, and bars. 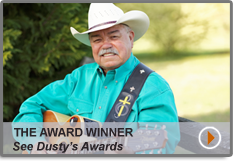 Dusty had always loved to sing and once he found Christ, he needed to sing about his new love in Christ. 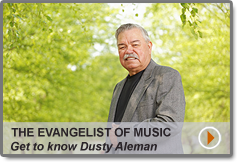 The combination of his style of music and the message of the gospel gave Dusty the vehicle he needed to share his love for Christ. 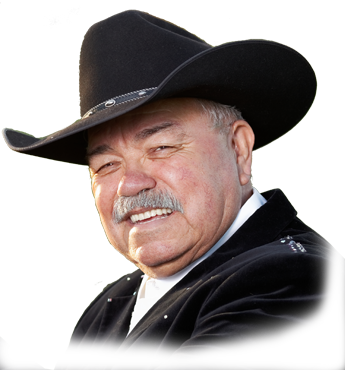 Dusty and his wife, Myrna, have 3 children together: two daughters, Stephania Swinney and Lori Walzcek; and one son, Jason Aleman. They also have 2 grandchildren; Silver Lynn Dorsa and Shane Aleman. Dusty and Myrna are in the ministry full-time and they travel by motorhome all over the country. Dusty and Myrna say, "We want to share the love of Jesus and God's plan of salvation to a lost and dying world by song, Word, and testimony. Look us up, give us a call. God bless." "I'll bet you didn't know that I got my nickname, "Dusty", from riding bulls in rodeos."